To contribute to the preservation of the world heritage of the city of Petra, focusing on one of its emblematic monuments, the Djin block number 9. To hike the architectural monuments currently preserved in the city of Petra, promoting their proper preservation and dissemination. To establish new interuniversity and intercultural relations. To establish new heritage documentation procedures from the integration of laser scanning, photogrammetry and thermography technologies. 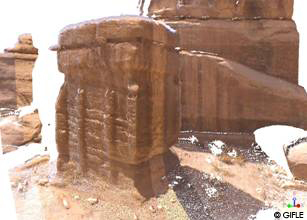 Djin Blocks are three-dimensional stone-carved funerary structures that resemble towers and are spread throughout the site of Nabataean Petra on white sandstone of Ordovician (belonging to the Paleozoic). Our study is centered in monument no. 9. The four sides are similarly carved, while the roof is flat and hollowed out, probably serving as a grave. A row of inset stones forms a cornice running all around the block from all sides. Today, corrosion of the clay water management systems surrounding Djin Blocks has contributed to the weathering of the monuments, and erosion from wind, water and salt threatens to destroy these monuments. Within this project we have established a methodology to accurately derive 3D photo-models of a World Heritage site by means of terrestrial laser scanning (TLS), thermography and close range photogrammetry. TLS provides 3D point clouds, as well as rough photo-models, that can substantially be improved draping texture with external imagery, both visible and thermal. 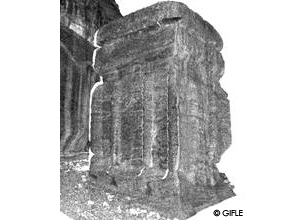 External pictures with either off-the-self digital cameras or scientific cameras can be used to enrich 3D models with maximum reliability. It is possible to enhance photo models draping external imagery onto the 3D model. It is advantageous to use whatever kind of imagery to record cultural heritage. 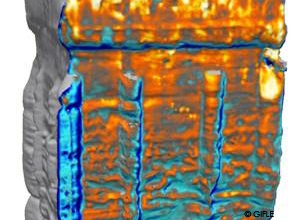 Thermal image with combination with visible images allow users to thoroughly analyse the state of conservation of stone structures. Intensity-based point cloud from the scanner. View of one single scan. Point clouds coloured from the scanner. General view after registration. Overall photorealistic model of the Djin Block No. 9: Western and Southern sides (left); Northern and Western sides (right). Detail of the thermorealistic model of the Djin Block No. 9. Eastern side. Visible orthoimage. Eastern side orthographic view of the Djin Block No. 9. Thermal orthoimage. Eastern side orthographic view of the Djin Block No. 9 at 08:15. Integration of TLS data and non-metric imagery to improve photo models and recording. A case study on Djin Block No. 9, Petra (Jordan). Navarro, S., Seguí, A.E., Portalés, C., Lerma, J.L., Akasheh, T. and Haddad, N., 2009. Integration of TLS data and non-metric imagery to improve photo models and recording. A case study on Djin Block No. 9, Petra (Jordan). In: R. Sablatnig, M. Kampel and M. Lettner (Editors), 15th International Conference on Virtual Systems and Multimedia (VSMM). IEEE Computer Society, 9-12 September, Vienna, Austria, pp. 58-63. Cabrelles, M. , Seguí, A. E., Navarro, S., Galcerá, S., Portalés, C. and Lerma, J. L., 2010. 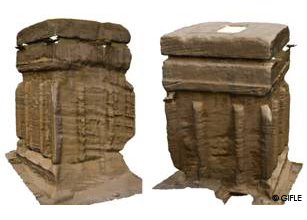 3D Photorealistic modelling of stone monuments by dense image matching. International Archives of Photogrammetry, Remote Sensing and Spatial Information Sciences, Vol. XXXVIII, Part 5. Commission V Symposium, Newcastle upon Tyne, UK, pp.121-124. Akasheh, T. S., Lerma, J. L., Cabrelles, M. and Haddad, N., 2010. 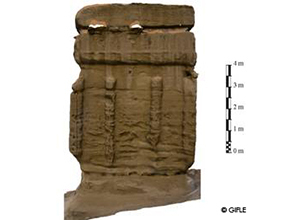 The multispectral and 3D study of the Obelisk Tomb in Petra, Jordan. 3rd International Conference dedicated on Digital Heritage (Ioannides, M., Fellner, D., Georgopoulos, A., Hadjimitsis, D., Eds.). Short Papers, pp. 35-40, 8-13 November, Limassol, Cyprus. Lerma, J. L., Akasheh, T., Haddad, N., Cabrelles, M., Seguí, A. E. and Navarro, S., 2010. 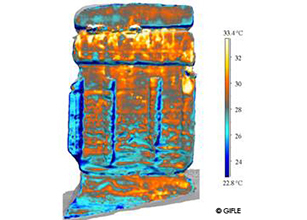 Stone surface temperatura analysis on the Djin Block No. 9 in Petra (Jordan). Proceedings of the 7th International Conference on Science and Technology in Archaeology and Conservation, pp. 224-232, Amman-Petra, 7-11 December, Jordan.